At the Strömsholm Riding School, Sara Grundström and Stina Burström in 2004 undertook a blind study that was conducted on horses with back problems. The results of this study are most certainly applicable to humans as well, especially since horses are not prone to the psychological influences of humans. The study was conducted over two consecutive three-weekly periods. Throughout the first three weeks, half of the horses wore only their normal blankets, whilst the other half wore the Back on Track back warmer as well. At the end of the first three-week period, both an independent veterinarian and a professional rider carried out an evaluation, neither whom were privy to the knowledge of which horses used the back warmers. The Back on Track back warmers were then transferred from the one group of horses to the other for the duration of another three-week period. At the end of that term, all horses were assessed again under identical circumstances to the earlier evaluation. After correlating all information, the indications were that eight out of ten horses improved their gait at the trot, and seven out of ten at the gallop. Despite the trial involving only ten horses, it reached a significant statistical result. 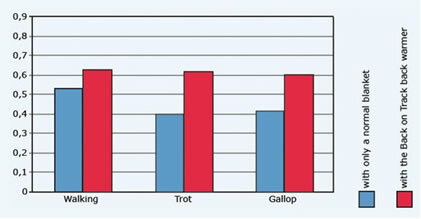 Scores from the evaluation (y-axis) of the backs movement during walking, trot and gallop, done by the veterinarian. 0 indicates a pathological back movement and 1, 0 a first-rate movement of the back. All 10 horses are included in each bar.